I tried to figure out a code for avatar from the 'avatar on last post' tutorial but i didnt make any sense :D could u tell me how to do it please? then, add this code where you want to have the avatar of the "user"
Have you tried the resource of Tiffany? the avatar works good now. Is it possible to add other variables like "posts" and PM's like this ? i think FMCodes is using the forumotion toolbar for this menu, i just want to know if its possible to add these things w/o the toolbar. that was my first question at this topic tho. 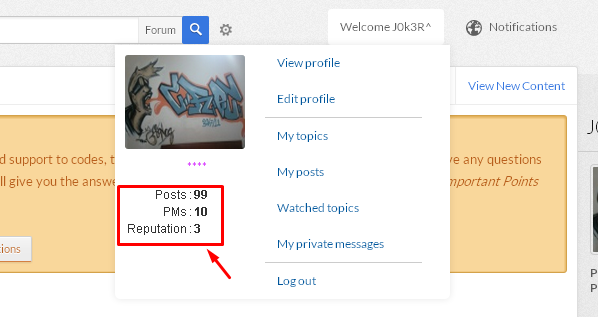 // A = User Post on the forums, B = User PM, C = User like given.